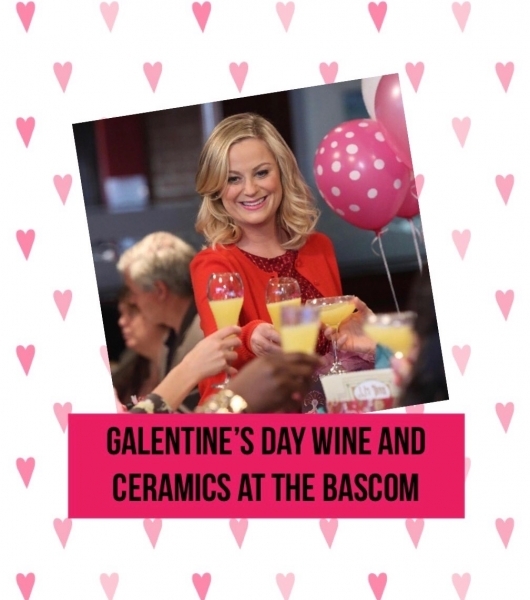 Calling all gal pals, February 13th is Galentine's Day and what better way to celebrate than with ceramics and wine during Wine Down in The Bascom's Dave Drake Studio Barn?! Wine Down is a great way to have fun with the creative process and relax with friends after a long day at the office. Projects can be made using the Potter’s Wheel or hand built using the slab machine. Examples of projects include bowls, mugs, serving trays with a sauce dish, bird houses, etc. By appointment only Tuesday - Thursday. Minimum of 2 people. The Bascom: A Center For The Visual Arts is located in Highlands, North Carolina. The Bascom focuses on providing excellent free admission exhibitions; a robust education department with art classes for people of all ages; and an expansive outreach program consisting of numerous partnerships with local nonprofit organizations. For more information about The Bascom, please visit www.thebascom.org or call 828-526-4949. Visit us in person at 323 Franklin Road, Highlands, NC. The Bascom is just across the covered bridge!